Figure studies for the ceiling of the Banqueting House, Whitehall. From 1629 until 1634, Rubens painted the ceilings of the Banqueting House at the Palace of Whitehall, the main London residence for England’s monarchs during the 16th and 17th centuries. Commissioned by King Charles I, the ceiling commemorates the reign of his father, James I, who united the kingdoms of Scotland and England. This oil sketch combines two figure studies for the ceiling’s many panels: the robed figure in the lower right is the yeoman in the Union of the Kingdoms, and Mercury appears in the Peaceful Reign of James I. At one time this composition was painted over to depict Mercury and Argus with a cow, seen in foreshortening from the back, and a dog, sleeping at the lower left. 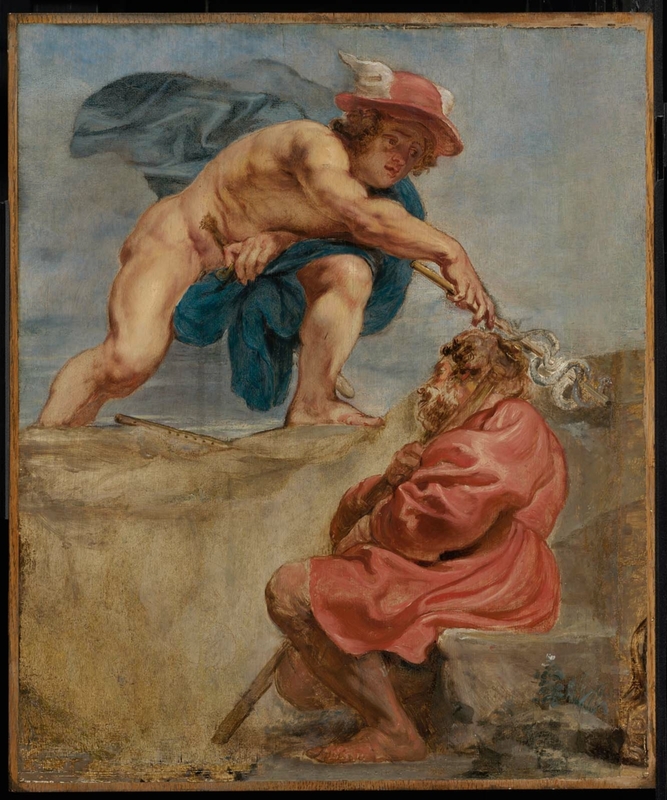 The description of the Rubens painting in the two Pauwels sale catalogues matches the appearance of the MFA painting in its overpainted state. Its dimensions (97 x 78 cm. ), however, do not. In Rubens: The Ceiling Decoration of the Banqueting Hall, Corpus Rubenianum Ludwig Burchard series, pt. 15 (London: Harvey Miller, 2005), vol. 1, cat. no. 3g, p. 181, Gregory Martin suggests that when it was in the Pauwels collection, the MFA panel was enlarged to allow for a mountainous landscape; this would account for the discrepancy in dimensions. Martin further suggests that the "additions may have been executed for the most part on paper laid down on panel," which would explain an annotation found next to the lot description in the 1814 sale catalogue: "faux et peint sur papier". If the MFA composition was enlarged, such additions were removed by 1881, when the painting was in the Beurnonville sale and its dimensions recorded as 65 x 52 cm. A wax seal on the reverse of the panel indicates that the painting was in the Sedelmeyer collection. Max Rooses, "L'oeuvre de P. P. Rubens" (Antwerp, 1890), vol. 3, p. 123, gives the name of the buyer. Martin 2005 (as above, n. 1). Ludwig Burchard, "A Loan Exhibition of Rubens," Wildenstein, New York (exh. cat. February 20 - March 31, 1951), p. 24, cat. no. 27; Seeger's dates of ownership are not given. A customs stamp from Berlin, found on the reverse of the panel, further indicates that the painting was once in that city. Julius S. Held, "The Oil Sketches of Peter Paul Rubens: A Critical Catalogue" (Princeton, 1980), vol. 1, cat. no. 139; also see Martin 2005 (as above, n. 1) for the stock number. Information from a photograph on file at the Witt Library, Courtauld Institute of Art, London, which shows the painting in its overpainted state. Information from a photograph on file at the Witt Library, which shows the painting in its cleaned state; also see Martin 2005 (as above, n. 1), p. 183, n. 8. Arnold Seligmann, Rey, and Co. provided provenance information that conflicts with the information given here. According to a letter from Paul M. Byk of Arnold Seligmann, Rey and Co. (April 21, 1942; in the MFA curatorial file), "the picture was in an American private family and ... the owner who disposed of it had inherited the picture from the parents. Thus the picture has been in America for the last forty or fifty years." In a telephone conversation recorded by William G. Constable, Curator, Department of Paintings, MFA (April 29, 1942), Byk said that he understood that the picture passed directly from Baron d'Eder into the aforementioned American private collection.